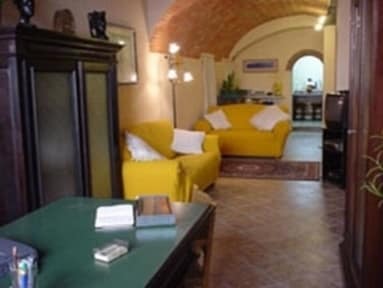 Siena, 이탈리아의 레 트레 페를레 B&B | 호스텔월드에서 예약하세요. Recently renovated and centrally located, we offer 5 rooms with private bathroom and A/C (selection of doubles, triples and 1 quadruple) in typical Tuscan style. Only 20 km from Siena. Parking facilities are available 100 mt. from us. There are also shops and restaurants nearby. The bus terminal is only 200 mt. away with regular connections to Florence, Siena, San Gimignano, Volterra and other places of interest. Lifts to the medieval town are 50 mt. away, an olympic pool is 400 mt. from us and the supermarket is 300 mt. away. There are also sports facilities 2 km. from us. From 1/3 to 31/10/2014 a 'Stay Tax' of 1 euro per person per day will be applied for a max. of 5 days (children under 12 are exempt).